The right on the photo is the R core output transformer in bare condition. The product is enclosed in the square case on the left. RW-20 is R core audio output transformer for single-ended amplifier. Excellent magnetic properties of R core as well as precisely wound construction of the coil by the computerized manufacturing system achieve the wide bandwidth, low distortion, and low magnetic loss of the transformer. What is R core Output Transformer? R core power transformers are now increasingly introduced for the high-end HiFi components because of its excellent technical advantages. 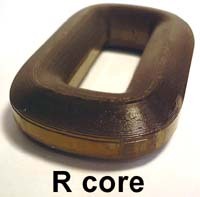 R core is of non-cut construction and has excellent magnetic properties. The magnetic core used for audio output transformer has evolved from EI core, cut core, and to toroidal core achieving successful results to improve the performance of the transformer. R core has several advantages over toroidal core that has been evaluated as the best. In fact, R core enables further technical improvements of the audio output transformer. We have designed this R core audio output transformer and carried out the performance tests for final product. The product packaging is made by Kitamura Kiden Co., Ltd., an originator of the R core transformer. For single-ended audio transformer, a gap is provided by cutting the core. This is for preventing the core from being magnetically saturated by superimposed DC current. A well-designed gap brings a constant inductance characteristic to the output transformer, an even level of inductance independent from the various levels of superimposed DC current or of the input signal, achieving the result that an audio output transformer has stable characteristics and good sound quality. Since R core has a good magnetic properties and excellent constant inductance characteristic, we are successful in introducing excellent audio output transformer for single-ended amplifier. With power handling capacity 20W, primary impedance selectable either 2,700 ohms or 5,000 ohms, equipped with ultra-linear tap, RW-20 is the best matched for single-ended amplifier using 300B, 2A3, 6CA7/EL34, 6L6, KT66, etc. Great result will be obtained especially with the combination of triodes such as 300B and 2A3. The combination of high performance core, generous turns of coil winding, and well-designed gap width achieve an excellent constant inductance characteristic, flat frequency response, and well-balanced mid and low range sound quality in the face of superimposed DC current that is inevitable for single-ended amplifier. Precisely wound coil achieves plain attenuation characteristic at high frequency having any peculiar peaks and dips as well as extended service limit of the high end. This makes possible stable NFB operation and transparency in sound quality. Perfect balance coil design achieves the low distortion factor, making possible a low distortion non-NFB amplifier. Push-pull connection is also available. You can use this transformer as constant inductance type push-pull output transformer. With RW-20, you can build a maintenance-free push-pull amplifier. Enclosed in a handy and beautiful square case. The same mounting dimensions as those of Tango XE-20 and FW-20. W: 3.27inch, D: 3.07inch, H: 4.21inch, Wt. : 3.3lbs. The table below describes the selection of load impedance and the relation of the phase between the primary and secondary. You can select non-inverted connection between the primary and secondary for two-stage amplifier and inverted connection for three-stage amplifier. When the load is selected to 5,000 ohms, two taps for UL are available; its feedback ratio is 50% or 25%. The higher ratio makes the plate resistance and distortion factor lower, however, the sensibility and output power will be reduced. Transformer cover case facilitates mounting on the amplifier chassis and assures good looking. The same mounting dimensions as those of Tango XE-20 and FW-20. The beautifully finished case is four-side welded construction and black metallic painted. The two main features are the wide bandwidth 40hz to 40Khz (-2db) and plain attenuation characteristic without any peculiar peaks and dips at the high frequency. The impedance characteristic is as well plain and quite similar to the frequency characteristic. The flat section of the impedance on the graph reads 4,800 ohms, a little bit smaller value than the nominal specifications. When the input signal level decreases, the permeability of the core also decreases, which results in poor frequency response at low end. This means that a minute and detailed low frequency response becomes difficult to present. Only the audio output transformer equipped with good quality core is successful in minimizing such deterioration of the low frequency's sound quality at small signal level (0.4V). If the high frequency characteristic of the output transformer is poor and such transformer is driven by beam or pentode power tubes having relatively high plate resistance, considerable amount of peaks and dips at the high frequency will present. In such case, the sound transparency would be lost and much worse, stable NFB would be practically impossible. Good quality output transformer minimizes the fluctuation of the high frequency characteristic caused by the different levels of signal source impedance. The graph below shows the frequency response of the output transformer driven by the signal source impedance=5,000 ohms, which represents the case that the transformer is driven by beam or pentode power tubes having relatively high plate resistance. It features a wide bandwidth 40hz to 40Khz (-2dB) and plain attenuation characteristic at the high frequency without any peculiar peaks and dips. Compared to the push-pull transformer RX-40-5, the low frequency at very small signal level (0.4V) drops to a certain extent. High frequency attenuates in a plain manner, presenting a characteristic very suitable for NFB operation. This represents the case that the transformer is driven by such as triode power tubes having relatively low plate resistance. The bandwidth further extends compared to the above case with the signal source impedance=5,000 ohms and the frequency response expands to 15hz (-2dB) at the low end and to 85Khz (-2dB) at the high end with every signal level. You will have an excellent result by the combination of RW-20 and 300B or 2A3. 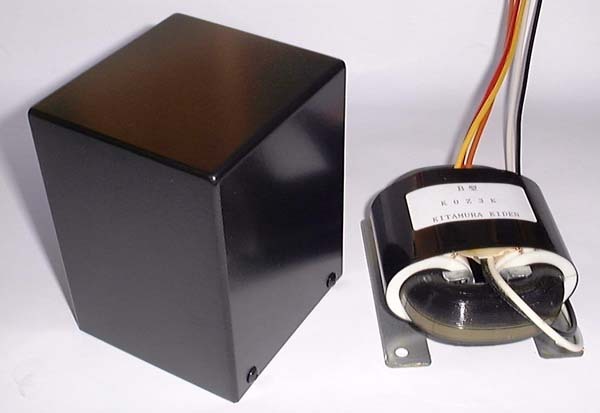 The primary inductance of the single-ended output transformer has a characteristic of constant inductance. With this, the output transformer can drive steadily the loudspeaker without being influenced by the level difference of the superimposed DC current or AC input signal. The less the inductance fluctuates under various conditions, the more solid and stable sound quality can be obtained. To make the primary inductance have higher value and less fluctuation under various conditions, well-designed core gap, generous turns of coil winding, and better magnetic properties of the core are indispensable. With the single-ended amplifier, superimposed DC current tends to fluctuate according to the output level change. When the primary inductance of the output transformer fluctuates because of the change of superimposed DC current, the low frequency response will also fluctuate. In other words, the low frequency response will change according to output power if the constant inductance characteristic of the output transformer is poor. lf the core gap is widened, the constant inductance characteristic is improved, however, at the same time the value of the primary inductance decreases and consequently the low cut-off frequency will rise. When designing RW-20, we attached greater importance to the constant inductance characteristic obtained from the excellent performance of R core. For this purpose, we have kept ourselves modest for the low frequency service limit. The primary inductance of RW-20 has an excellent constant inductance characteristic, 12H at minimum and 13H at maximum (5,000 ohms, superimposed DC current 80mA). The fluctuation of the inductance has been kept minimum. The graphs below show the inductance of the load 5,000 ohms and 2,700 ohms. You will notice its excellent constant characteristic. The inductance remains unchanged quite independent from the various levels of signal and DC current unless the core is saturated. We have installed RW-20 on our 300B single-ended power amplifier and carried out the measurements. Since this is a test amplifier, the output transformers are not enclosed in case and unconnected lead wires are untouched for future tests. The low frequency extends down to 15hz (-3dB) within 1W output. At 6W, the frequency response below 30Hz attenuates because of the core saturation. Since the maximum permissible output is proportional to the square of the frequency ratio, the permissible output of RW-20 is 20W at 50hz that is exactly the design value, and then 7W at 30hz, 5W at 25hz, and 3W at 20hz. The high frequency extends up to 75Khz (-3dB), quite a good figure. The high frequency attenuation curve is very plain except small peak at 200Khz. The curves below represent a total distortion factor of the 300B amplifier and not only that of the output transformer itself. The distortion of 1Khz and 10Khz are low and remain at a quite same level. The curves are very simple. The distortion of 100hz is a little bit worse than that of 1Khz, however, this is an average performance as a middle size 20W single-ended output transformer. The graph below shows the frequency characteristic with NFB=3dB. At 1W output, the bandwidth is improved to 12hz to 85Khz (-3dB). At 6W output, the saturated core makes attenuate the response of low frequency below 30hz, nearly same characteristic as of non-NFB. The high frequency goes on excellently and attenuates in a plain manner. The graph below shows the distortion factor with NFB=3dB. You will notice very low distortion factors at 1Khz and 10Khz. At 100hz, the distortion is not so good as those of 1Khz and 10Khz; however, this is enough a low level as single-ended amplifier. The primary coil of RW-20 is perfectly symmetrical the center of which is set at red lead wire. This construction enables RW-20 to be used as constant inductance type push-pull output transformer, fairly suitable to build a DC unbalance current proof, maintenance-free type push-pull amplifier. The table below describes the connections and specifications as constant inductance type push-pull output transformer. The two main features are wide bandwidth 40hz to 95Khz (-2dB) and plain attenuation characteristic at high frequency without any peculiar peaks and dips. The low frequency response is the same as that of single-ended connection, clearly worse than that of RX-40-5, an exclusive push-pull output transformer. High frequency response is improved to 95Khz (-2dB) compared to the single-ended connection. 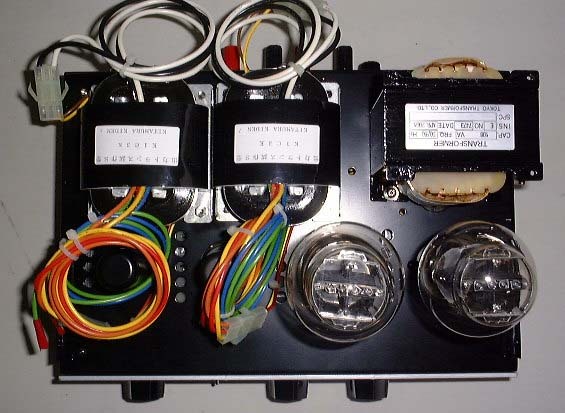 This is because such push-pull connection of the transformer is equal to parallel drive of 1,250 ohms transformers since the center of the primary coil (red lead wire) is connected to the common source. The high frequency attenuates in a very plain manner, quite suitable for NFB operation. The impedance and inductance characteristics are the same as those of the single-ended connections. Please refer to those characteristics.